This is a case study to show how a workshop around rainwater harvesting, siphoning, using a water pump in a muddy kitchen and sowing wildflower seeds had a positive impact on the curriculum. The aim of this project was to introduce the children to motion and force in action. It was also a way to show the children and teachers a way of taking science outside to provide practical links to the things children learn in the classroom. The demonstration took place on 14th April 2016 and lasted for 2 hours 30 minutes. The children were primarily a class from Year 3, we also presented the workshop to the after school gardening club. To initiate the workshop, we introduced ourselves to a year 3 class and then presented them with some key words like siphoning, rainwater harvesting and forces. We took the children to the area at the back of a classroom where four Intermediate Bulk Containers (IBC) stood, each containing 1000L of rainwater. 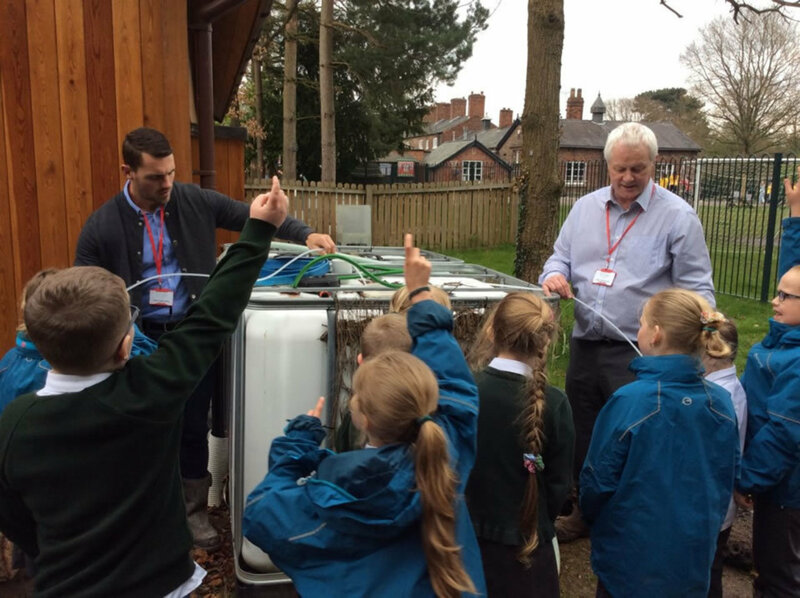 We started by asking the children where they thought the water in the tank came from, some of the children suggested the tap. We then discussed rainwater and what they thought rainwater harvesting is. The children were then asked to suggest some of the uses for the rainwater to which they replied watering plants. You are a fresh new face and male role model. One of the positive outcomes that came from this demonstration was the engagement of the children who sometimes have a hard time concentrating in the classroom. The demonstration was mostly hands-on and practical which engaged all of the children. One reason for this could be that the staff in Styal Primary School are predominately female and Mrs Shaw stated “you are a fresh new face and male role model”. This is imperative for the children’s education as it can cement learning that has been taught by the teachers in the classroom. The demonstration also gave children the understanding of how water moves and comes through he taps as Mrs Shaw suggested “children just except that things happen” like water coming from a tap. When children go into the muddy kitchen in the forest school area they now understand how it works and how the water gets there making the learning outcomes from the demonstration purposeful. It also gives the children an understanding of new concepts and a link back to force and motion in their maths lessons. After the workshop the teachers asked us to do the same presentation with the gardening club, which the children also thoroughly enjoyed. To extend future demonstrations we will make mini-models of the siphoning activity and show children how to use water in pipes as a level gauge. The teacher has also asked us to come back to the school for a presentation during Aspirations Week on the different jobs and skills that the Great Grounds team have.